Sian was an animal assistant at Secret World Wildlife Rescue before coming to work for Quantock Veterinary Hospital. She holds a HND in Animal management and qualified as a Veterinary nurse in 2004. She has work for the Hospital since 2000, with two short breaks to have her children Adam and Ellis. 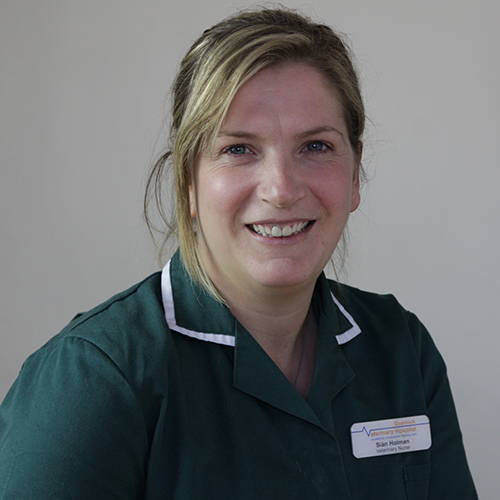 Sian’s veterinary nursing interests include consulting, inpatient care and dentistry. Sian received an award from the British Veterinary Nursing Association in 2009 to persue her interest in Veterinary Dentistry and gained a certificate in veterinary dental nursing in 2011. Sian is also trained as a clinical coach for training and assessment of veterinary nursing students. Sian has two cats; Georgie and Lola, and a jack Russell Terrier called Ollie.